It was the day she was to be cremated. I'm not sure what it is in the front? No incense was burning and no one was smoking. I'm not sure what it is. Incense smoke burning from the funeral presiding!! It could be some whispy hair in front of the lens. Sorry, my friend, about your grandmother. But she's always with you no matter where you are. And II'm sorry about your photograph. It is a few hairs from the photographer. But since someone had to die for this photo, I'll give you five stars and my condolences. Not what you think . I checked your picture out. 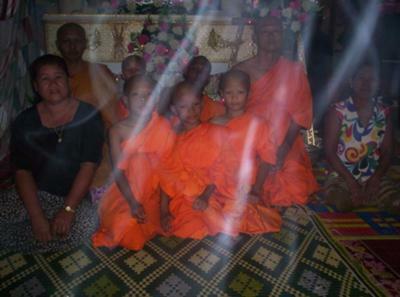 If you think there is a spirit in your picture or something from beyond there isn't. Sorry my friend. What is to the right? Was there another room? or space that someone can stand to the very right of the coffin there seems to be a human shaped shadow and on the right shoulder of the man on the far right there is a head shaped shadow but I'm sure there is something that can account for that. But I was very curious about the shadow figure it seems you can see a head, shoulder and torso. Hi,my name is Judston from Palau Island, I just wondering that maybe shining light over this picture is the sign of happiness, that grandma wanted to tell her grandchildren, children that, I'm going to heaven but I still love my children, relatives, and grandchildren as well. Looks like hair in front of the lens! My condolences on your grandmother, I recently lost mine too so I can sympathize. However, the strands in the photo look like your own hair in the way of the flash. Maybe it was your grandmother saying goodbye to you? ...your own hair falling in front of the lens reflecting in the flash? It's kind of cool. They have a lot of pictures like these at the "oregon vortex". They claim that their particular geographic location is where several magnetic bands that circle the earth cross. It's the same kind of "energy" for lack of a better word. I'm very sorry to hear about your Grandma. Although it does appear to be smoke, perhaps it could be mist - since it was a funeral and doubtful that smoking was occurring.